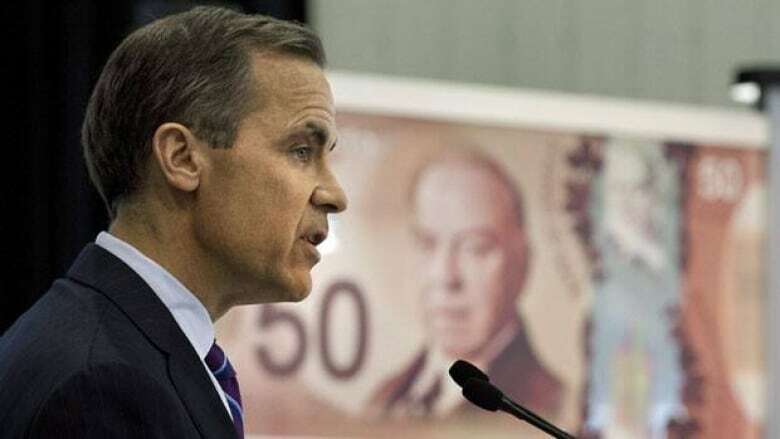 The Bank of Canada governor Mark Carney says that if Canadian household debts continue to climb toward dangerous levels, he's ready to act to prevent a crisis. Mark Carney has a dilemma: He views record high household debt the number one domestic risk to the economy, but believes he would hurt the recovery if he raised interest rates to slow borrowing. But the Bank of Canada governor said in an interview with The Canadian Press that he would be prepared to intervene if things got out of hand. "In exceptional circumstances, if there are issues that threaten financial stability, such as household debt ... the bank could use monetary policy for that purpose," he said. "That factors into our decision-making without question." By Carney's telling, the situation is not that far from reaching the point of exceptional circumstances. He is encouraged by the recent slowdown in the housing market. Household debt as a proportion of disposable income was close to 151 per cent at the end of last year. The Bank of Canada's own analysis expects the ratio to approach the 160-per-cent level reached in the United States just prior to the 2008 financial crisis. That's in part because Canadians keep borrowing to buy homes, or take out loans on their homes, and because income growth has slowed to below the rate of inflation. Canadians don't think they are overly indebted, in part because super-low interest rates have not moved appreciably in several years and private sector analysts keep telling them the central bank is unlikely to hike for another year despite all of Carney's huffing and puffing. As long as rates remain low, reports suggest Canadians can afford the homes they have bought. The latest RBC home affordability index, which measures the monthly cost of maintaining a home in comparison to pre-tax income, found affordability remains within historical norms and actually improved at the end of 2011, even in Vancouver. Such talk worries Carney. Record levels of debt may not seem like much of a concern as long as home prices keep rising and interest rates remain rock-bottom, he concedes. The big worry is if interest rates rise -- as they must one day -- with a concurrent drop in home prices, those circumstances will set off a cascading series of blows to Canadian consumers. Home owners will see the value of their assets fall at the same time the burden of servicing their debts rise and income growth remains modest. At this point some households will be over their heads in debt; many others will be forced to cut back on spending, slowing economic activity in Canada. Private sector economists are almost unanimous in the view that housing prices are too high in Canada in relation to fundamentals, such as incomes and the cost of renting. That suggests a correction is coming, in the neighbourhood of 10 to 25 per cent, with some hot markets like Vancouver and Toronto possibly facing an even bigger reckoning. "If a point comes where house prices adjust downwards, the question is how is that going to impact consumption behaviour," Carney asks. "There is history in other jurisdictions where this has a bigger impact on consumption on the way down than it does on the way up. And the consequence of that is consumption slows, growth slows, income slows, debt serviceability deteriorates, etc, etc." In effect, the fall in home prices will do to the economy what he fears doing by raising interest rates. Carney reiterated that broad-brush Bank of Canada policy should be the last resort to correct what is essentially a specific problem. Other policy-makers in government have more finely-tuned instruments. Finance Minister Jim Flaherty has tried to deflate the housing bubble three times in the past six years by tightening mortgage lending rules. Canada Mortgage and Housing Corp. and the Office of the Superintendent of Financial Institutions have also tweaked the system and may be preparing to do more. On Thursday, OSFI weighed in again, telling bank executives that they have not always been following policies recently set down by their boards of directors on lending risks. "Going forward senior management will have to provide a declaration to the board that the financial institution is in compliance with the OSFI guideline (that they are following board policy)," OSFI head Julie Dickson said. More measures are in the offing. In last week's budget, Flaherty said the government will introduce legislation to increase the governance and oversight of CMHC, which provides insurance on mortgages against default. Carney said he also has spoken to bankers directly about curbing their lending practices. He made clear hiking rates solely to restrain the housing market would only be considered if debt threatened the country's financial stability and as a complement to other measures. But he said the new agreement with government penned last year gives him the power to act if necessary.